James Bond’s first meeting with the new Quartermaster is another opportunity for a clunky reference to 007’s age and dwindling usefulness. A scruffy, lank haired, bespectacled youthful looking person, sits next to Bond at the National Gallery to share a first exchange in front of JMW Turner’s 1838 painting of The Fighting Tremaire, tugged to her last berth to be broken up. If you could excuse a quick pause. In Dr No, Goya’s painting of the Duke of Wellington appeared in the baddie’s lair – in real life it had recently been stolen from the National Gallery. And 007’s “You must be joking” line was popped straight in; a repeat line from Goldfinger. As this was the 50th anniversary film of Ian Fleming’s super spy’s first big screen incarnation, there are a huuuge amount of homage references for fans to spot throughout the film; including more stolen paintings, including one just in time for the film's next gadget. Anyway, back to the dialogue. And on to the movie’s first gadget – as it should be – on the 50th anniversary of Dr No, it is the same gadget and indeed the first gadget, of the franchise. 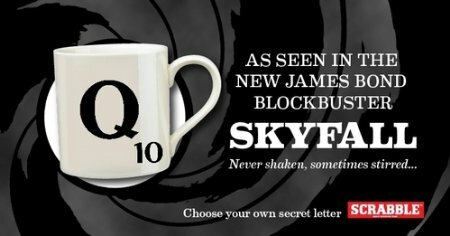 Skyfall is fairly heavy on the product placement, and perhaps the movie makers best ever inexpensive gift product is the Q mug, which our new Quartermaster drinks out of throughout a scene later in the film. You can obviously get your own white mug printed with the letter Q on it, but this Wild and Wolf version is the licensed product that features the Scrabble letter scores on the reverse and explanatory print underneath. You can purchase one for just £6.95 at the link below. Except, in all fairness an exploding pen could always come in handy.